I have done a number of reviews now in and around my home town of Shrewsbury, but am yet to do too many from further afield. This means that every time I do, it feels like a big deal – this is no exception! I recently organised a trip with some sailing chums (I know, get me) that I know from all around the country. As a result of living so far away from each other, we rarely get the chance to spend time together which is a real shame as we get on so well. The task of organising fell to me so, using all of my planning skills (which are poor at best), I arranged to go to Manchester. A number of folk wrote back with suggestions (thank you), but one in particular really caught my eye. My friend Becky suggested “The Oast House”. Now it is not specifically known for its burgers, but the pictures I found of the place were enough to get me excited. Most were of people eating and drinking under a huge marquee/tent/outdoor seating affair and the food looked smashing. When you couple this with the fact it served real ale, it was a must try. My friends and I arrived at The Oast House and were surprised by how busy it was. 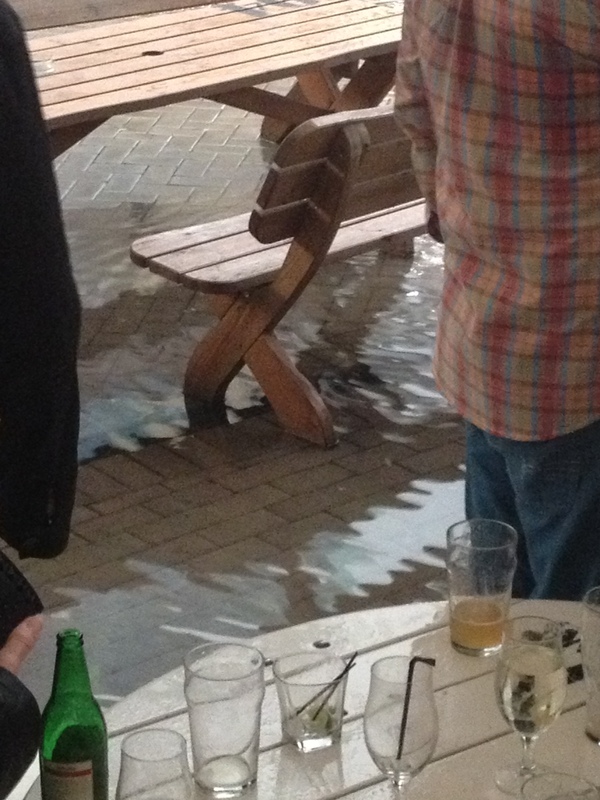 It had, as I mentioned, a large outdoor seating area which was pretty much full to bursting. I ventured inside in search of ale whilst a few of our party found a seat. I returned, beer in hand and my friends had already opened the menu to the page which contained the burger – they know me so well! Now Manchester is not widely known for “Flash floods” but I can honestly say, I have never witnessed anything like what was about to happen. Without warning, the heavens opened and everybody not under cover was instantly drenched. We felt invincible under the middle part of the marquee and even laughed at these unfortunate souls stuck out in the wet (horrible but terribly funny)!! By a happy coincidence, we were sat on one of the centre-most tables and as the rain got worse, we noticed people all around were rising from their seats and moving closer to us. The rain got harder and the wind got stronger until it was practically horizontal. More time passed and more people were standing and heading straight for our table until, at last, we were the only people in the whole place that were seated! The hysteria was mounting, particularly amongst the scantily clad lasses that were all having a pre-night out meal! This just made the whole situation funnier until we realised that the drains all around us had given up trying to take any more water, and that a flood was literally heading our way! Now I have never been waiting for a meal, and seen a bottle of ketchup floating by like we were lost at sea – first time for everything I suppose! 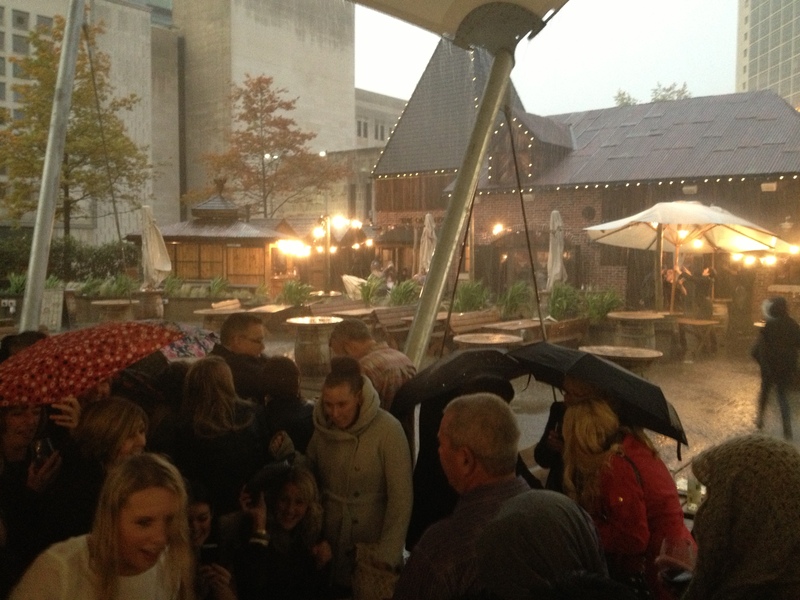 Bless The Oast House staff who had been battling the weather and who had already bought one attempt at our meals under the cover of umbrellas, only to reach us and say “your food is water-logged, sorry”! The second attempt was more successful and by this time, the water (and people standing all around us) had thankfully dissipated and we were able to enjoy it in relative calm. 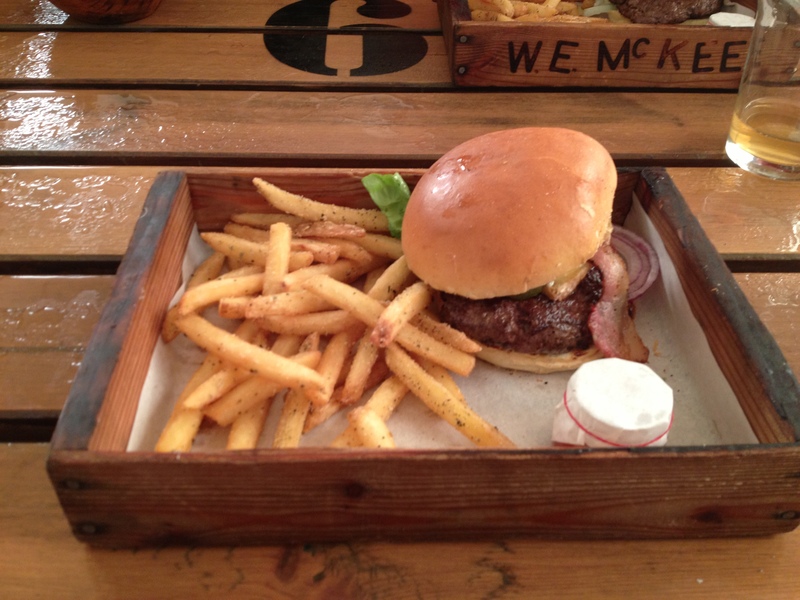 The burger I had ordered (that’s right, I’ve not forgotten), arrived not on a plate, but instead in a wooden tray which I must say, was a real treat. You may know from my other reviews that I am not a fan of bread boards, but this was different and I loved it! The chips were not the chunky chips I am a fan of but were described as “properly seasoned” and, by gum, they really were! They were well cooked and were really very very tasty – perhaps I have been converted to a skinny chip kind of man?! 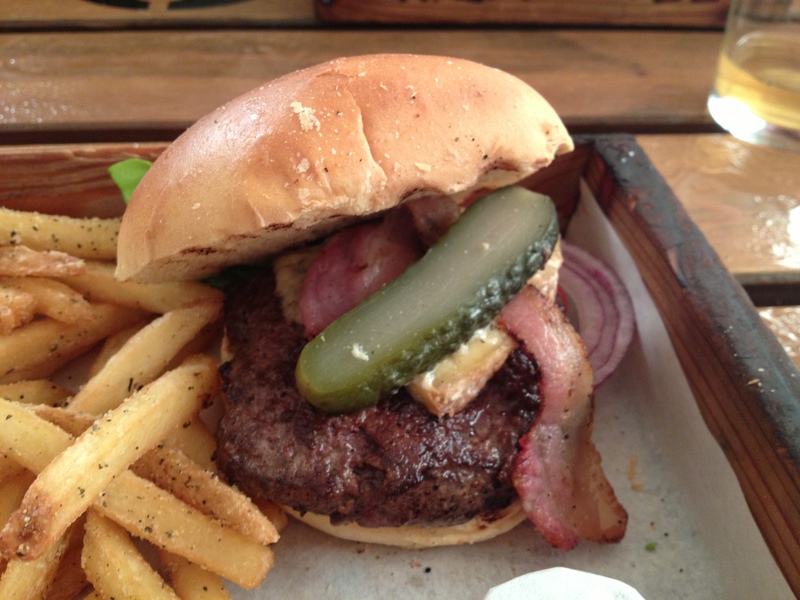 The burger itself looked very appetising but I am glad I opted for the bacon and blue cheese as I think it may have looked a tiny bit boring on it’s own. The cheese was not a gooey sauce but instead, an actual slice of blue cheese and was absolutely delicious! The patty was well cooked and the bun was not at all dry (no jokes about the rain please). It was sweet and tasty and the gherkin was fresh and crispy which really worked well! Also worth a mention is The Oast House salsa which was fantastic (I would even go as far as to say one of the best I have ever had)! The meal was great but the atmosphere was better! Perhaps it was the freak weather, perhaps it was the ale or the food, either way, I would highly recommend you try The Oast House!